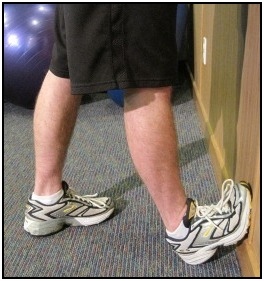 The standing calf stretch is one of the most basic exercise stretches. You can use it to limber up before exercise, lifting, running, or to relax a muscle spasm. So, here are a few different ways to do it and ideas for stretching. And remember to always warm-up before stretching to get the most out of it. For this one, face a wall with one foot forward and one foot back. 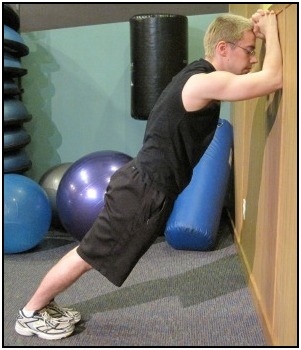 Place your hands or forearms against the wall. Make sure that both of your feet are pointing forward. This will make sure that you're stretching your calf muscles. Keeping your rear foot fully on the ground, bring your hips forward to stretch your calf muscle. Hold it for 10 - 20 seconds. Stand straight up with both feet on the floor. Hold onto something (wall, bar, etc.) to keep your balance. This is a useful PNF stretching technique for your calf. And very simple to do. Place the ball of the foot you want to stretch up on something (small step, textbook, large broom handle, wall, etc.). Then simply lean forward to give your calf the stretch. Also, you can stretch both calves at once using version #1, but place both feet back to be stretched. Then simply lean your hips forward to stretch you calves together. 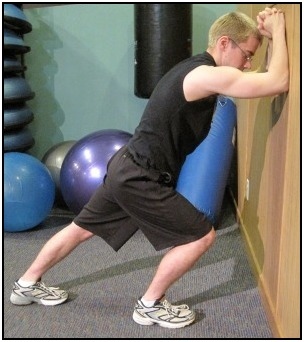 • Click here to leave 'Standing Calf Stretch: How To Do It' & go back to the Home-page! 1. Anderson, Bob. 1980. Stretching: 20th Anniversary. Bolinas, Calif: Shelter Publications. Pp. 15.